Controls Upgrades - Sage Automation Inc.
Sage Automation has chosen Rockwell Automation’s Logix platform as the centerpiece of our robotic control system. Everything – including motion, transfer cars, end effector, and supporting automation equipment – is all handled by the Logix processor. Rockwell’s PanelView Plus provides advanced yet easy-to-use graphical Human-Machine Interface (HMI) with customized operational screens. A reliable, modern Programmable Automation Controller (PAC, though also referred to as a PLC), Logix can handle any automation control task. Although the Rockwell platform is our current preference, Sage Automation welcomes other choices based on customers’ needs and specifications. Integrated motion and I/O control. Virtually unlimited axes of servo motion. Servo axes can be controlled in independent motion groups each with its own program and operational states, or used for coordinated motion. Prioritized multitasking for multiple programs. Advanced communication and networking capabilities. Bar code processing, product sorting and tracking. A completely integrated servo solution is available with Rockwell Automation drives and motors, communicating to the drives using SERCOS or CIP Motion over EtherNet/IP . As a more cost effective solution, we also offer Bosch Rexroth IndraDrive servo drives and motors that communicate with EtherNet/IP. Many I/O options are available. Logix supports many options using in-rack I/O. For distributed, in-cabinet I/O, Sage uses Rockwell Automation’s Point I/O on EtherNet/IP. For machine-mount I/O, Rockwell’s ArmorBlock I/O, also on EtherNet/IP, is a cost-effective yet rugged solution. Additionally, we can accommodate other I/O systems to conform to end-user specifications. Operator uses push buttons or customized HMI to start, stop, and reset the robot. 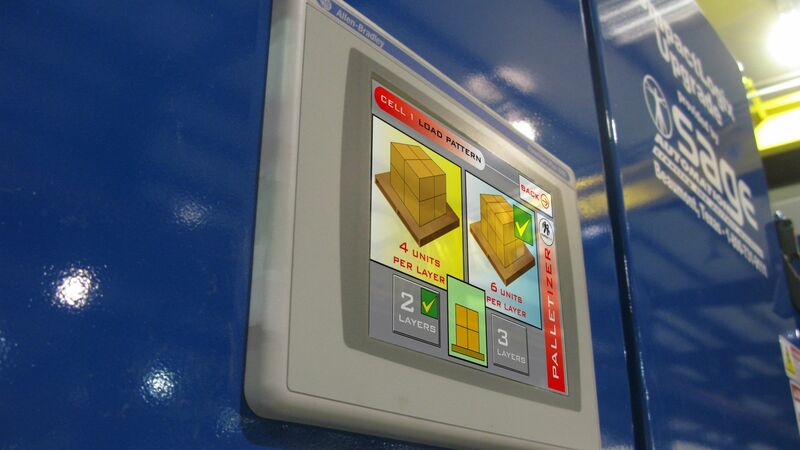 Product or Pattern selection through HMI with no down time. The HMI allows the operator access to make on-the-fly parameter changes, including creation of new patterns. System status and error conditions are reported to the screen in simple English statements. Optional LED board and large indicator lamps. To aid in troubleshooting, I/O points can be monitored from the screen. Each I/O point is accompanied by a description. The operator can monitor the state servo axes, including limit switches, drive faults, current position, etc. Sage has chosen EtherNet/IP as our standard communications solution. This includes servos, variable speed drives, distributed I/O, HMIs, and peer-to-peer communications. However, we can support a wide array of networks, including serial, generic TCP/IP, Profibus, DeviceNet, ControlNet, etc.